The UR arrives in two similar cardboard boxes – one with the controller and one with the robot itself. Unpack both boxes and place the controller on a table or the floor. The robot is folded in foetus position and can be placed on a table, stand or any place that is prepared with 4 holes that fit the foot base. 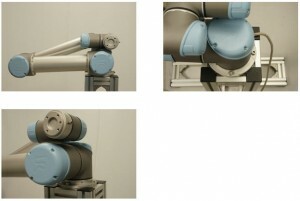 Since the robot is folded in this transportation position is not possible right now to fit all 4 bolts, but 1 or two is enough to hold the robot – so just fit the bolts where the base holes are accessible. The monitor is a touch screen monitor and can be operated as it is with pressing the screen and onscreen keyboard. It is possible to connect a mouse and keyboard to the USB connector on the side of the monitor and especially a mouse is useful.